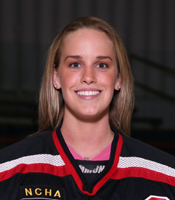 LAKE FOREST, Ill. - The Lake Forest College women’s hockey team earned three points from a pair of Northern Collegiate Hockey Association home games over the weekend (February 3-4). On Saturday the Foresters skated to a 1-1 tie with UW-Superior, the fifth-ranked team in the nation, and on Sunday they defeated Finlandia University 5-1. Lake Forest is now 8-4-5 overall and 3-2-4 in NCHA play. Superior scored the only goal of Saturday’s opening period with exactly a minute left on the clock. After a scoreless second stanza, the Foresters tied the game on junior Kerry Gotowka’s (West Simsbury, Conn./Westminster School) second goal of the season with just 7:11 remaining in regulation. Her power play score was assisted by junior Laura Wilson (Corunna, Ont./Sarnia Sting). Lake Forest was out-shot 37-22 but senior goaltender Sally Bevis (Huntington, N.Y./North American Hockey Academy) stopped 36 of 37 Yellowjacket shots on goal to earn the tie. She is now 3-3-3 on the season and ranked third in the nation with a .937 save percentage. Freshman Ryann McCarthy (Lombard, Ill./Team Illinois) was between the pipes for Sunday’s contest and tallied 22 saves. She raised her record on the year to 5-1-2 and her save percentage to .908. Junior Courtney DeHoey (Chatham, Ont./Bluewater Jr. Hawks), the Foresters leader in points, scored the first goal on Sunday at the opening period’s 9:56 mark. Her 11th score of the season was assisted by senior Katie Snowden (Toronto, Ont./Willowdale Redwings). Wilson lit the lamp just 68 seconds in to the second stanza off an assist from freshman Jamie Sauer (Eagle River, Wis./Northland Pines H.S.). Senior Michelle Ricketts (Rochester, Mich./Honeybaked) made the score 3-0 with her second goal of the year at 9:20. Freshmen Maggie Bresser (Fond du Lac, Wis./Waupun H.S.) and Carolyn Thiess (Naperville, Ill./Canterbury School) each had an assist. Wilson scored her team-high 14th overall and second shorthanded goal of the year at 1:59 in the third period. DeHoey earned the assist. Finlandia got on the scoreboard with a power play goal at 2:44 and junior Allison Rushing (Seattle, Wash./Seattle Admirals) closed out the scoring at 17:05 with her fourth goal of the season. The power play score was assisted by Ricketts and freshman Courtney Bean (Peoria, Ill./Team Illinois). Lake Forest will host league-leading UW-River Falls next weekend (February 9-10). Friday night’s game will be played at 7:00 p.m. at the IcePlex in Pleasant Prairie, Wisconsin, and Saturday afternoon’s 2:00 contest will be played back on the Lake Forest campus.